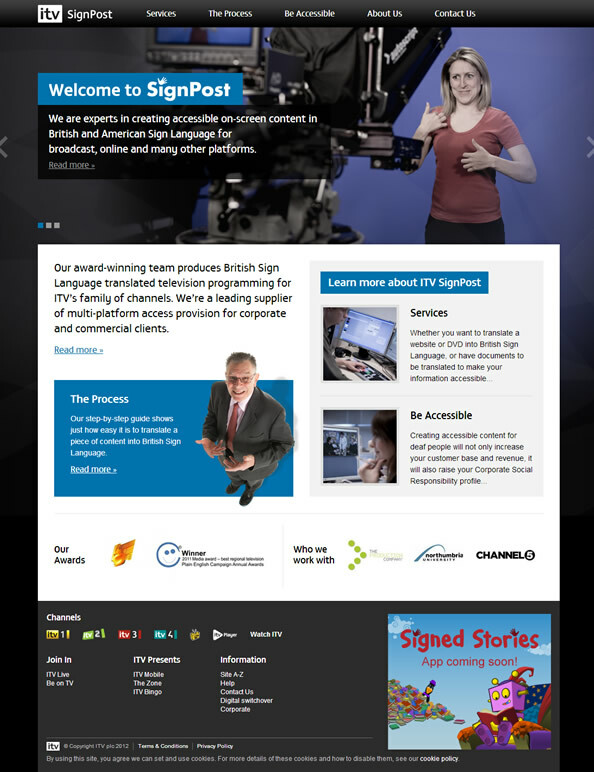 Earlier this summer, Union Room was given the opportunity to create a new website for ITV SignPost, the team behind British Sign Language translated television programming for ITV’s family of channels. The website was recently launched to the public, and we are delighted to be able to speak about the project for the first time. The previous version of the SignPost website had been in place for several years, and we were tasked with bringing the website’s design up to date to reflect the company’s new branding and provide more information to the user about the processes involved in producing this kind of work. 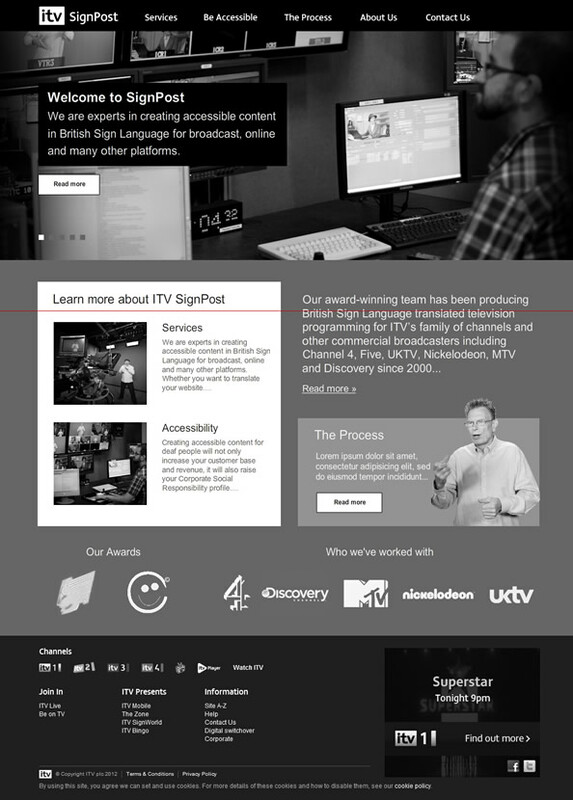 We worked closely with the SignPost team to come up with a content plan for the new website. This involved discussions around what potential users (of all types) would require from the website, and how this might be presented on each of the relevant sections. SignPost guide their customers through what can seem like a complex process, making it easy to understand what is required from both parties. It is this kind of information that we wanted to promote on the website. 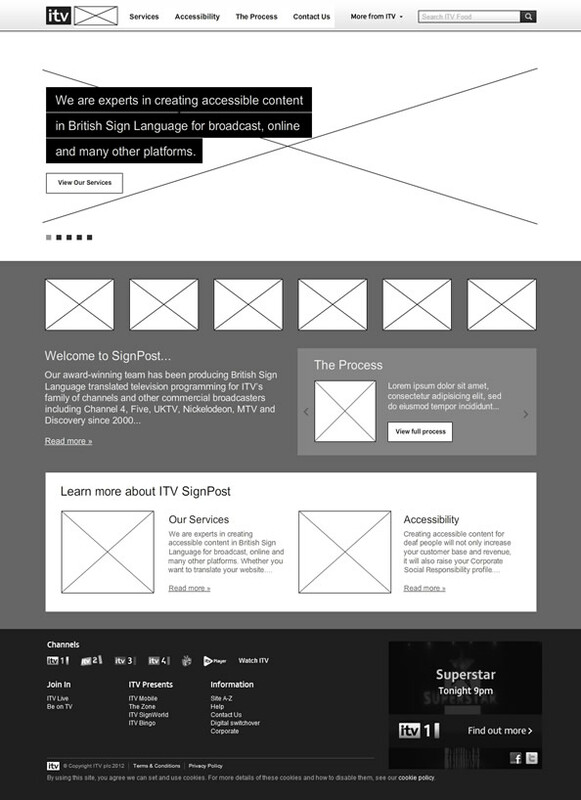 Once content was agreed, we began to work on the website’s wireframes. We typically produce several variations of a homepage as a starting point – this gives us a good opportunity to experiment with different layouts and gain feedback from the client on the positioning of specific elements. We really enjoy working closely with the client in this phase, as we find it gives everyone an opportunity to have an input on how the website will ‘work’. As we progress through the wireframing stage, we like to introduce more design elements as we gather decisions from the client. We find this helps provide a more accurate representation of how imagery etc will be presented in the full visual. The wireframe you see below is the version we decided to take into the design stage. I mentioned earlier in this post that SignPost had recently undertaken a brand redesign, so this was a primary focus of ours when beginning to look at the visuals for the new website. One major advantage of a thorough wireframing process is that all major layout decisions have been taken, meaning we just have the task of applying the brand guidelines and a set style to the elements on the wireframe. This is another point in the project where the client’s input is important, as we like to gather opinions on everything from the way in which image galleries might function, to the use of colours, typeface and specific imagery. After several rounds of tweaks, we arrived at a version that the SignPost team were happy to take forward into the development stage. We worked alongside the internal ITV development team throughout the build process, to ensure the files we delivered met internal standards and were consistent with previous builds. For external testing and sign off, we used ITV’s version control system. The project has been an extremely rewarding experience for our team, as the website also aims to raise awareness about accessibility and how businesses can bring their media (websites, videos, documents etc) into line with the Equality Act 2010. There are approximately 9 million people in the UK that are deaf and hard of hearing, meaning there is a huge potential target audience to tap into. “From our initial tender enquiry, through to development and delivery of the new design, Union Room’s creativity has resulted in a stylish new corporate website. Their professionalism in understanding our core target audience was a significant factor for us commissioning the work and the process of engagement throughout the project ensured the brief was completed to an excellent standard.